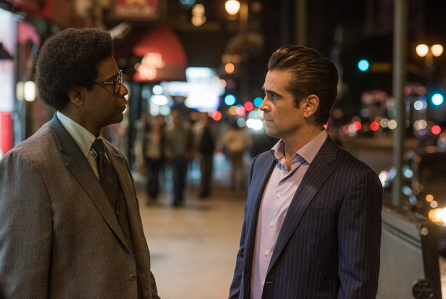 Like his directorial debut Nightcrawler, Dan Gilroy combines a myopically focused central character with Los Angeles landscapes in Roman J. Israel, Esq. Denzel Washington is Roman, the secret weapon in a small law firm known for its justice fighting pursuits. He’s a behind the scenes legal guru who’s uncomfortable in the courtroom and dealing with people in general. When the public face of the firm suffers a heart attack, Roman (who I’ll refer to as that but always uses his full name and title) must go job searching. He pairs up with George Pierce (Colin Farrell), who runs a more successful operation that puts dollar signs over the virtuous work Roman is used to. It creates an opportunity for him to expand his wallet, as he struggles with the morality of his more high scale surroundings and assignments. Part of the conscience searching is represented by Maya (Carmen Ejogo), a civil rights activist inspired. She works in an underpaid environment that her new friend would flourish in. Yet he also is effective with George until a questionable ethical decision about a murder case changes things. Gilroy created a masterwork in 2014 with Nightcrawler. In that, Gilroy wrote Jake Gyllenhaal his best role as a strange but ingenious man whose work comes before all else. That traits apply to Roman and we have Washington providing a unique and always watchable performance. With big glasses, an Afro, and an extensive music collection constantly filling his ear buds, we’ve never seen Denzel quite like this and he seems to relish it. Unlike Nightcrawler, this picture doesn’t totally work. The court case involved is practically an afterthought. The interpersonal relationships between Roman with George and Maya feel a tad underserved. This may be because the central figure here can’t get too close to anyone, but the film sometimes feels as distant as he is. Washington almost makes it all worth it anyway, but ultimately Roman J. Israel, Esq. is well meaning and also slightly disappointing. When you’ve got yourself a documentary about a major Hollywood production that never ended up being made and its director Tim Burton isn’t the most eccentric individual being interviewed, you’re probably in for something fascinating. And so it is with The Death of Superman Lives: What Happened?, which tells the tale of why Burton’s proposed reimagining of the Man of Steel never made it to the screen. The more eccentric character is by far Jon Peters, the mega producer who had successfully worked with Burton to bring Batman to the masses in 1989. The two were deep into pre-production on the late 1990s Superman Lives project before the plug was pulled and some of this doc’s greatest moments involve Peters being interviewed and, even more so, other people talking about him. Peters started out as Barbara Streisand’s hairdresser before becoming a major producing player. We hear tales of Peters’ insistence on having a giant spider featured in the film, his preference on having scripts read to him while he lays on the couch, his proclivity for putting employees in headlocks and trying out his jiu jitsu moves on underlings. There’s a lot more to the story of how Superman Lives died and director/writer Jon Schnepp explores it in great detail here. This documentary has had its own difficult history in finally being released and it was partly funded through a Kickstarter campaign. The Supes reboot went through three screenwriters during its gestation: Kevin Smith at first, who brought his comic book geek sensibility before being jettisoned by Warner Bros brass, Peters, and Burton; Wesley Strick, who would eventually suffer the same fate; and its final writer Dan Gilroy, who would go onto direct my favorite pic of last year, Nightcrawler. Nicolas Cage was to star in the title role and there’s even fascinating footage of him trying on the iconic Superman costume, which the doc spends a lot of time talking delving into. In the late 1990s, Cage seemed like a fairly logical choice as he was coming off an Oscar for 1995’s Leaving Las Vegas and headlining A list action projects like The Rock, Con Air, and Face/Off. In other words, it was a few years prior to Cage seemingly accepting every single script that came his way. Other casting choices are discussed, including Sandra Bullock as Lois Lane, Chris Rock as Jimmy Olsen, Christopher Walken as Brainiac, and Kevin Spacey as Lex Luthor (that actor would go onto play him in 2006’s Superman Returns). What emerges from the documentary is a film about a film never made (it was three weeks away from shooting) that probably would’ve been something to behold. Would it have been good? Hard to say. The two subsequent Superman reboots that would follow years later (the aforementioned Superman Returns and 2013’s Man of Steel) were both rather disappointing in my view and many comic book lovers felt the same way. Burton’s track record over the last quarter century has been hit and miss. While his take on Batman was a rousing success, his “reimagining” of Planet of the Apes in 2001 left much to be desired. What’s clear is that it would have been a much different Superman than we’ve ever seen and would have looked a whole lot different (the long portions about its production design are quite intriguing). One important through line that runs in the doc is the fact that Superman Lives was by no means guaranteed massive success in the late 1990s. We must remember that it wasn’t until the turn of the century that 2000’s X-Men truly helped usher in the golden age of comic book flicks that we’ve seen steadily over the last 15 years. When this project was gestating, 1997’s Batman and Robin had essentially killed that Caped Crusader franchise until Chris Nolan brought it back to life eight years later. Warner Bros. was nervous about a similar fate for Burton’s new project. Ironically, it was Batman and Robin director Joel Schumacher who killed Burton’s Batman series and helped pump the brakes on Burton’s budding Superman picture. For comic book lovers, The Death of Superman Lives: What Happened? will be a treasure trove of intel on why this project never saw the light of day. Yet for movie fans in general, it provides key insight into how movies are made… and how some aren’t made. And how its possibly crazy main producer was obsessed with spiders and jui jitsu.